In my last review I discovered that I liked the issue a lot more if I just imagine Lady Thor as secretly being Mary Jane Watson. It helps this issue too, but unfortunately I find this more issue less enjoyable than the last two. Verily, diminishing returns. I don’t really know where to begin. We start with events past and get the reason for the Ice Trolls to join with Malekith. Then back to now where a hammerless Lady Thor fights trolls and Malekith fights a minotaur. The fights resolve but before we move on to round two, (hammered) Lady Thor vs Malekith, Thor Classic appears. The biggest problem I have with this issue is that happy coincidence reigns supreme. Male kith chooses not to use a handful of seconds to dispatch this new Thor. The door is too strong for the hammer to breakthrough but not strong enough for Thor to pull apart. This happens just in time to prevent a change back to human form (MJW) and allow to the hammer to, with no guidance, take out the remaining trolls. Everything that happens feels like it deserves the phrase “Well, that was lucky,” right down to the arrival of new Thor. The hand of the author looms heavy. Also, because it is just a slugfest I don’t feel there was any real character building accomplished, especially not for our title character. Now, to let the nerd rage out a little bit, I’m not sure I like the choices being done with Lady Thor’s power set. First off, it is unclear what she can and can’t do and which of those powers are dependent on the hammer. In this issue we see her having super-strength and also wield lightning without the hammer. No problem with the strength, but I do frown a little at little at controlling lightning. Thor Classic is the God of Thunder. Even without Mjolnir Thor is the God of Thunder. Someone else wielding the hammer does get those powers and I like them having enhanced strength while in Thor-form, but am not as much a fan of them having the non-physical powers of Thor without the hammer. So, unless Lady Thor is secretly Storm or Crystal, I wish she didn’t have lightning powers. (But, like I’ve told anyone who will listen, she is Mary Jane Watson. Because it is awesome that way.) All that said, this is just personal preference so I won’t say not doing it this way makes it a bad issue, but it is less enjoyable to me personally. I also don’t like the hammer acting with it’s own will to take out baddies. I don’t think it has ever been had such intelligent weapon characteristics before. It’s been around over 50 years, so it probably has but that doesn’t make it normal and not what I would consider a good idea. Again, it just feels like hand of the author. Also, enough with the teasing of who this character is under the mask. Since issue one it seems there have been clues, red herrings, winks, about who this character could be. This issue we get a “she fights like a Valkyrie.” Wink. And the whole losing powers and the costume slowly fading away felt more like it was to tease a reveal than to suggest danger at loosing powers. In the end this just feels like wasted space. Spend time making me care about whoever she is rather than trying to string me along by making me interested in the mystery. I want to care for her. I don’t want to care about who her secret identity is. The art is pretty enough. But the inking feels really inconsistent. Dauterman varies from a very fine line to a thick chunky one. But there doesn’t always seem to be a reason for using one or the other. Neither option looks bad, but going back and forth was distracting to me. Also his special affects (Malekith’s magic, Thor’s lightning, Freeze breath) looks like carious squiggles and, except for the freeze breath, just muddies the page and takes away more than it adds. Here is the thing that really just annoyed me. 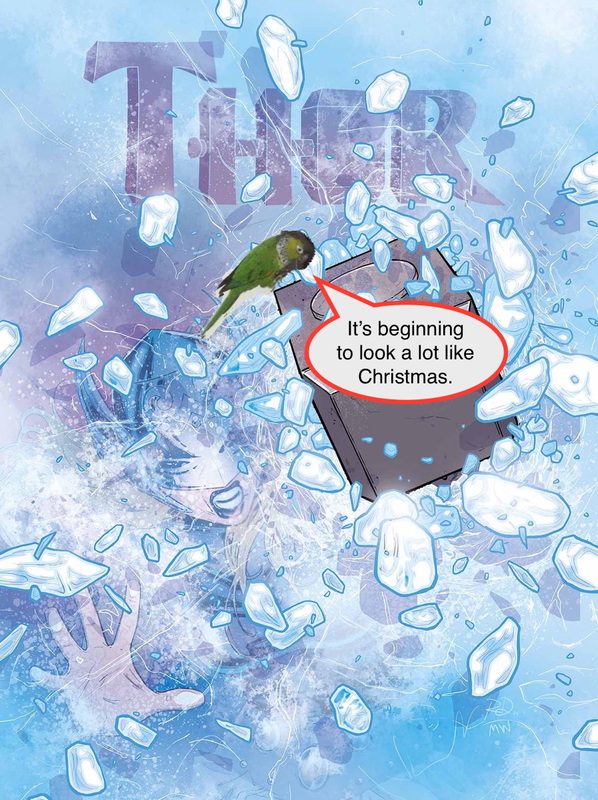 Thor #3 and Angela Asgard’s Assassin #1 have way to similar endings. They were only released a week apart. They share assistant editor Jon Moisan and editor Wil Moss. Shouldn’t someone have said it might be a bad idea to have two books essentially share ending beats only a week apart? Sure, it isn’t exactly a criticism of the issue itself, but to read the whole issue while thinking how convenient and unoriginal it all felt, sharing an ending with another title doesn’t leave a pleasant final impression.